The Smelly Web Indexes are to Alexa web site rankings what the Dow Jones indexes are to stock prices: they measure the performance of a group of related webs sites based on weekly changes in the Alexa rankings of individual sites. 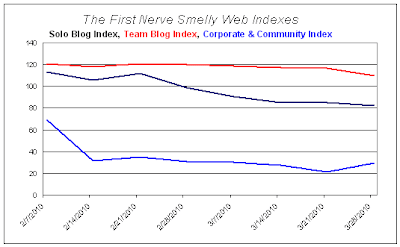 When they were started on August 9, 2009, each Smelly Web Index was set to 100. This week there were big ranking changes in both directions for sites in the Solo Blog Index, which continued a months-long decline by dropping three index points. Leading the upward movers was JaimeLeParfum with a 17% boost in Alexa rank. AnyasGarden rose 13% as did Vetivresse which put an end to five consecutive down weeks. Large declines at other sites pulled the overall SBI lower. GlassPetalSmoke dropped 27%; the site has been silent since December 30. The top five solo blogs (with Alexa ranks above 1,000,000) were all down. The Team Blog Index took a seven-point hit as all five component sites dropped in the Alexa rankings. The TBI has been relative stable the past few months. 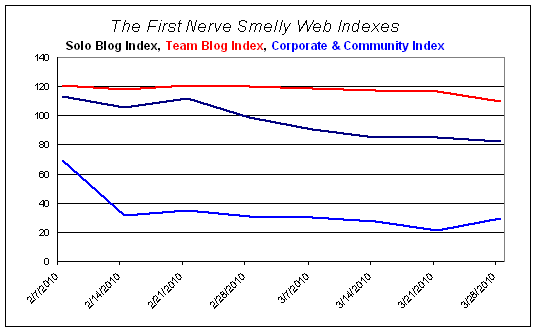 The long-suffering Corporate & Community Site Index had a happy nine-point bounce, led by an 18% rise at Sniffapalooza. Newly redesigned OsMoz appears to have put the brakes on the big declines of recent weeks; it was off just 1%. I love your blog and this Alexa is getting on my nerves already, right Avery? "And so the Age of the Solo Bloggers came to an end, and they boarded a ship and sailed into the West with Liv Tyler and her pointy elf ears." At any rate, ten percentage points does not a Gotterdammerung make. Please, Your Majesty, don't shoot me I'm only the messenger. I am complaining about Alexa. Majesty? Of what kind? Banana Land?